12 vibrant Flash Colors in one palette. 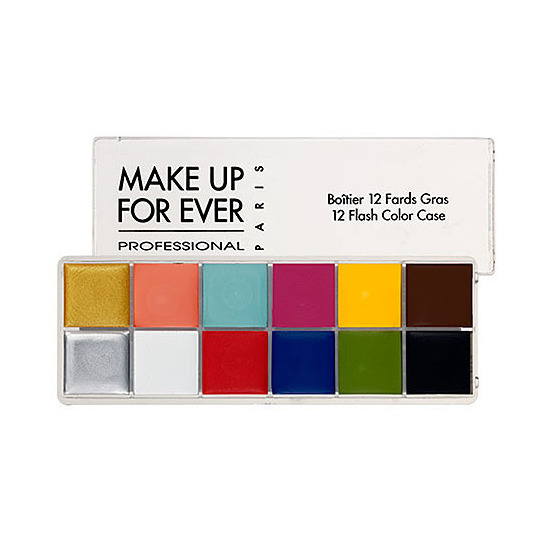 This 12 Flash Color Case is found in the kits of many well-known makeup artists. You can create an array of looks with this palette and it's great for traveling. It can be used on the eyes, cheeks, and lips. This palette contains Gold 004 (metallic gold), Coral 002 (vibrant coral), Turquoise 000 (light turquoise), Fuchsia 005 (bright fuchsia pink), Yellow 013 (vibrant yellow), Brown 023 (dark brown), Silver 003 (metallic silver), White 010 (pure white), Red 017 (bright red), Bright Blue 014 (bright royal blue), Leaf Green 008 (bright green), and Black 011 (pure black). The Make Up For Ever Flash color case is a must have for me in every application. I use the colors to adjust or adapt foundation or concealer or to bring any variety of color anywhere on the face. I can use this to create any concealer, color correct, foundation, eye, lip, cheek or mascara or merely add it to existing color to have an unlimited palette. A must have for every artist. I recently got the Flash Palette after tons of friends told me how much they love theirs. The colors are so great and they go on really well. I'm still just getting my feet wet with it and am somewhat new to cream-y makeup, but have really enjoyed what it's done so far. One friend uses it to do bright color stuff on her eyes and lips and another MUA friend uses it to mix the colors together to make skin tones that are more accurate to a person's tone. So that's quite a range of applications. I can't tell you how many times this product has saved me. I use it underneath eyeshadows to make them more vibrant. I use mixed into foundations, concealers, primers, etc. With this I can always create the perfect shade of anything. The consistency is amazing and easy to blend. You get a lot of product for the price. This palette is a staple and must in my MUA kit. I use these colors to create one of a kind lip colors, correct imperfections such as redness, sallow skin, orange skin from too much tanning, as eye shadow base, liners and for other creative uses for editorial makeup. I used it as a red eye shadow and lipstick over a primer for a magazine editorial. I can't stress enough how great this product is. I LOVE this palette of creams. I bought this palette a couple of months ago for my makeup kit. I just started using this palette about 3 weeks now on clients and I LOVE it. 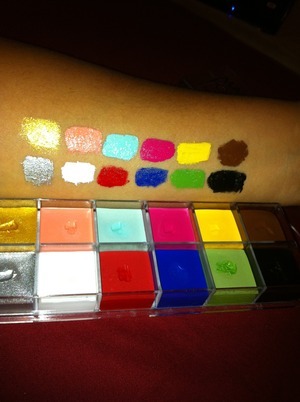 You can use the colors as eyeshadow bases or mix them to use as lipstains. I can say that this product is very much like NYX jumbo eyeshadow pencils. The differance of course is price. And you don't have to deal with depotting and you get a lot MORE PRODUCT. It is well worth the $. Very little goes a long way! The colors in this palette are super bright, pigmented, and blendable. You can mix them with other things and put them anywhere on your face. Because they're so blended, you also hardly need to use any of the colors to get the desired color, which makes the price worth it by far. Definitely very versatile and worth buying. 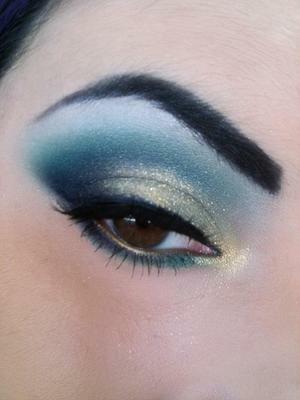 However, when put on your eyes, the colors crease quite quickly and easily, even when a powder is layered over them. Also, the colors do stain. If you put the pink or red on your eyes (which, admittedly, is not recommended but who cares?? ), it will stain. The color will go away in a day or two and is very light, but it definitely does stain. So buy it if you want a versatile, pigmented, colorful palette but beware at your own risk. Perfect for dramatic and theatrical looks! I got this palette on Christmas, and I have to say it's amazing for doing crazy costume looks and for mixing up an unusual-colored base for an eyeshadow look. The one thing I have to stress is when using this on the eyes or using it for stage, you MUST set it with some sort of powder product and use a primer underneath! Otherwise it will crease or sweat off. My most-used color in the palette is the silver, because it can add sparkle under matte eyeshadows or give super intense shimmer if you want to go for that otherworldly sheen. It doesn't have a light-grey base the way many silver cream shadows do; it's got intense clarity and seems to be micro silver glitter in some sort of colorless base. It doesn't read as glitter though, it reads as pure chrome! Overall, I love this palette, but on a budget, I would suggest purchasing NYX jumbo pencils and melting them down into pots instead. You can get the $95 results without paying $95 to get there. It is rare that I don't pull out my Make Up For Ever Flash Color Case on a job. It is simply one of the most versatile and pigmented cream color products on the market. The formula is fantastic and the range is lovely. Color correcting and customizing are a breeze with this palette. An essential for the professional's kit and a great buy for any diehard makeup lover. You can create anything with this palette with knowledge of color theory. It is also fantastic for SpecialFX and character makeup. The pigment is rich like all Makeup For Ever products.